Many of the transformations you will encounter have the potential to create multiple products – isomers – from a single starting material. The reactions shown in the drawing, for instance (I’ve left the actual reactants vague) could each form a mixture of constitutional isomers (i.e. regioisomers), diastereomers, or enantiomers. The potential of these reactions to produce multiple products is both a curse and an opportunity. It’s a curse in that we have the potential to create multiple products, each of which have to be separated from each other. But it’s an opportunity in that if we can develop reactions that can yield one isomer over the other (and vice versa) we have a very useful tool: we can start with a simple starting material – like an alkyne – and transform it into several complex products through a series of selective reactions. That’s extremely powerful. (For that reason, I like to say that alkynes are like a blank canvas – you can decorate them many, many different ways). Here comes a part of organic chemistry terminology that can trip people up. We can have selective reactions and specific reactions. Selective means “mostly”, or “almost all”. Specific means “all”. “Selective” implies that there are factors which favor one product over the other, while “specific” is usually a sign that there’s something inherent to the mechanism that leads to only one product. It might sound like semantics, but there’s some disagreement on where to draw the line for “selective”. For instance, is a reaction that gives you a 99:1 ratio selective or specific? I’m in the camp which believes that 99:1 is merely “highly selective”. Specific reactions are 100:0 . I am always very careful not to use “specific” where “selective” would suffice. The opinion of your instructor (or textbook) may vary. Regioselective reactions: This is where a starting material forms two (or more) structural isomers, and one predominates. A good example is Markovnikoff addition of water. The major product is where addition has occurred on the most substituted carbon. The mechanism doesn’t rule out a small amount of the minor structural isomer. (Note that this reaction as shown, forms a 50:50 mixture of enantiomers. It is regioselective, but not enantioselective.) Hydroboration is another example of a regioselective reaction: it is highly selective for the less substituted alcohols. Like I said, some instructors might consider this reaction regiospecific, even if it is >99:1. I would make the case that it is merely highly regioselective. Stereoselective reactions: An example of a stereoselective reaction is shown in the next drawing. In the 2.2.1 bicycle shown, attack of the per-acid from the top face is highly favored, which leads to dominant formation of the epoxide on the left. There is also a small amount of the epoxide on the right. Stereospecific reactions: A perfect example of a stereospecific reaction is shown in the third drawing. Because the SN2 proceeds through inversion (100%) a given starting material will produce the product with the inverted stereochemistry. The second starting material (the enantiomer of the one above) will produce the enantiomer (100%). Two different isomers go through the same reaction manifold to provide two different enantiomers. There is no “leakage” of one to the other. There are actually quite a few examples of other stereospecific reactions. The hydroboration reaction is one (cis addition), as is catalytic hydrogenation (gives cis products), addition of bromine to double bonds (anti products), epoxidation, cyclopropanation, the Diels Alder, and more. There are also reactions which are enantioselective. They aren’t covered as much in Org 1/Org 2, but the 2001 Nobel prize in chemistry was given to Noyori, Sharpless, and Knowles for their development of some key enantioselective reactions. Some of the most cutting-edge organic chemistry going on at the moment is concerned with designing highly enantioselective reactions. The concept of selectivity is not exclusive to one type of isomer. 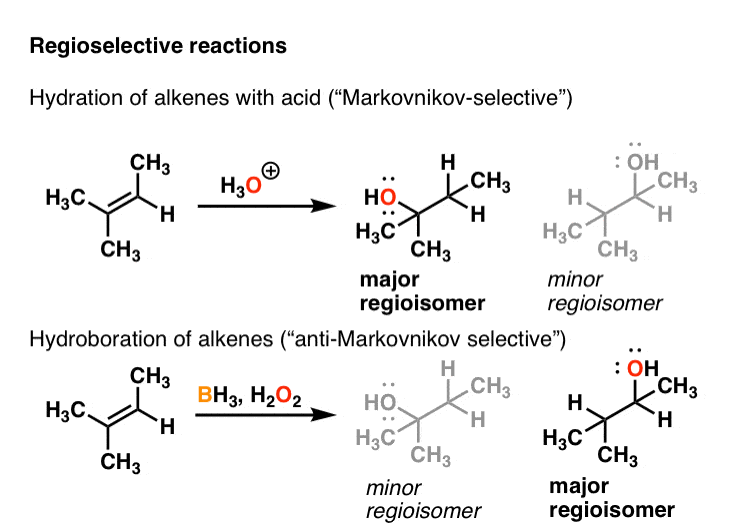 You can have a regioselective reaction that is not stereoselective (like the Markovnikoff addition of water to alkenes) as well as regioselective reactions that are also stereoselective (like hydroboration. In fact, enantioselective hydroborations have been developed, which are therefore regioselective, stereoselective (for the syn addition product) and enantioselective. 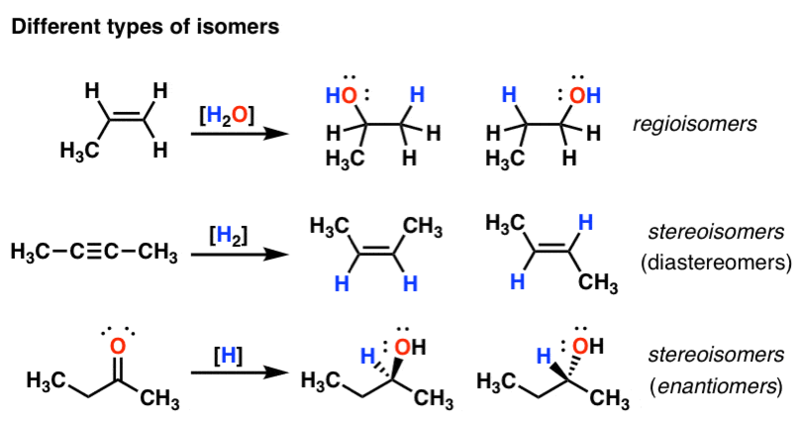 It depends on what kind of isomers you can form from your substrate. 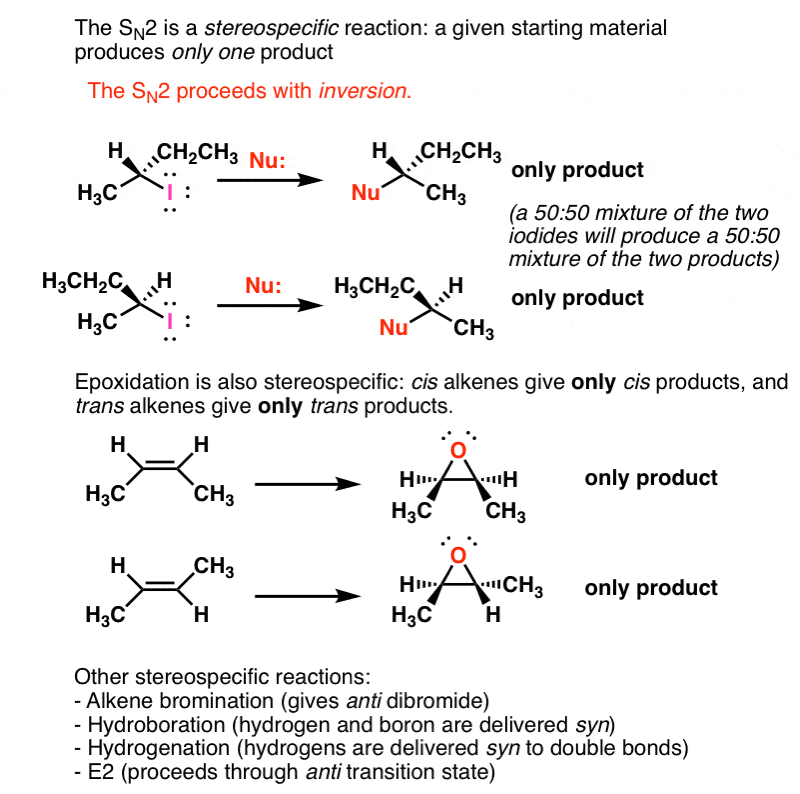 reaction which is both stereospecific and stereoselective both is the reaction between bromine and alkene……it is stereospecific because which stereoisomer we obtain depend upon which stereoisomeric alkene and stereoselective since from given alkene we obtain only one diastereomer or one pair of enantiomer. All stereospecific reactions are stereoselective, since a sterespecific reaction gives a product ratio 100:0 and stereoselective reactions require any ratio other than 50:50. A stereospecific reaction could be thaught as 100% setereoselective i.e, when the selectivity becomes 100% to a particular product of a stereoselective reaction. However a stereoselective reaction never can be called stereospecific. All stereospecific reactions are stereoselective but all stereoselective reactions are not stereospecific. In the stereoselective reaction, in regards to the major product, what about that face of the 2.2.1 bicycle makes it the least hindered? Hi James! I just had a quick question in regards to the example with 2.2.1 bicyclic compound example that you used. I actually thought that you would get predominantly the dashed product because of the “pointy part” potruding towards the top face of the molecule makes the top face more sterically hindered no? Hi Frank – thanks for your question. The addition to the top face (“exo”) is favored – if you look at the bottom addition (“endo”) you’d see that instead of a one-carbon bridge getting in the way, there’s a two-carbon bridge getting in the way. For this reason attack is preferred on the same side as the 1 carbon bridge (“endo”). Interestingly though, if you put 2 methyl groups on the 1 carbon bridge the stereochem flips to endo. Hi, i have some confusion regarding stereospecificity. Isnt it different stereoisomer reactant gives different stereoisomeric products,then the reaction is stereospecific. example, (R)-reactant gives the configurationally inverted (S)-product, and (S)-reactant produces (R)-product. but why epoxidation of cis alkene produce only cis-product? If the reactions that proceed through carbocation formation can be stereoselective…For example,The dehydration of alcohols thorugh E1 mechanism.Will this be anti elmimation similar to the case where the same reaction proceeds via E2.? after observing the reaction how we can say that its a stereoselective or stereospecific reaction? Hi James, great article. I’d like to cite you in an assignment I’m doing for my Chemistry degree. How would i do that please? In my opinion, an interesting addition to the explanation above is how IUPAC defines the terms (actually for me this is the only correct definition, even though it sometimes takes ages to really understand what it means). Stereoselectivity is defined in http://goldbook.iupac.org/S05991.html. Stereoselectivity has to do with the preferential formation of one stereoisomer over the other in a reaction. Stereospecificity on the other hand (defined in http://goldbook.iupac.org/S05994.html) has to do with the fact that compounds that differ in their configuration (i.e. that are stereoisomers of each other) give a different reaction outcome in terms of stereochemistry of the products (cis- and trans-2-butene give different compounds upon reacting with bromine). Using stereospecific in the sense of ‘with high stereoselectivity’ is actually discouraged by IUPAC. Here one could maybe prefer to use the terminology highly stereoselective (probably also ill-defined) or completely stereoselective depending on the case under investigation. This is illustrated in the following example: the reduction of 2-butyne with H2 in the presence of a Lindlar catalyst is a completely stereoselective reaction: the cis-alkene is exclusively formed. This however is NOT a stereospecific reaction (at least not in the IUPAC sense of the word) as 2-butyne does not have a stereoisomer that could react differently. Is SN1 Stereoselective reaction or not? Example of stereoselective reaction of alkynes?? Lindlar reduction to give cis-alkenes. Sodium metal reduction to give trans alkenes. Why would you say hydroboration is regioselective? Is that based upon actual experiments and empirical data you’ve looked at? If the hydrogen has a partial negative charge with its bond with Boron, why would it add to the more highly substituted carbon instead?